This gift card display has (3) clear pockets for holding certificates and business identification. 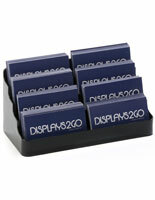 Each holder is designed to stand on countertops in check out locations or on office desktops. 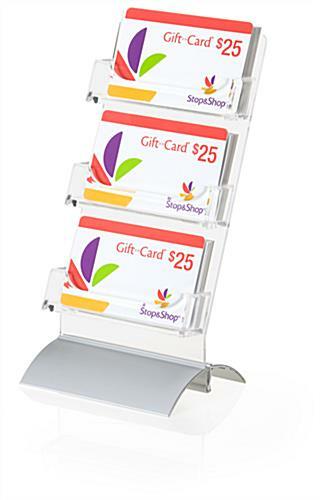 This countertop gift card display is ideal for use in point of purchase locations where shop customers can easily see them. When small impulse items are placed at checkout areas customers are more likely to purchase a certificate at the last minute before making a purchase. 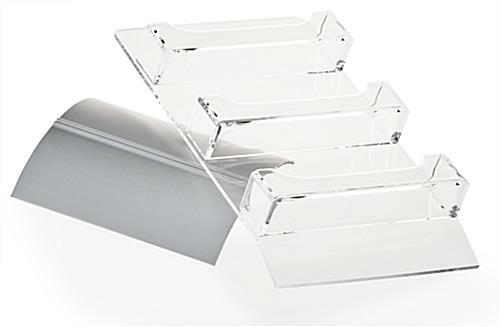 This gift card display that is for store countertops features an attractive silver base that may be detached from the acrylic holder for cleaning. This functionality is ideal for transportation as well as storage. 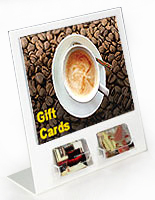 This gift card display that is plastic features a base that is curved in a modern and attractive design. 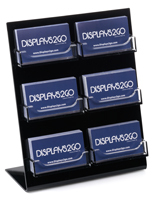 When the stand is placed at retail point of purchase locations it is sure to catch customers attention. 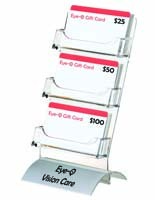 Each 3 tier gift card display stands at a slight angle so that guests can easily see the certificates held in each of the holder’s pockets. 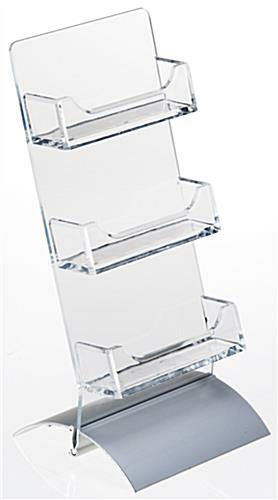 Consumers will be standing over this unit at checkout counters, so it is important that the shoppers can easily see the entire contents of the acrylic stand. 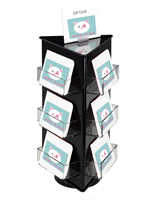 This gift card display that has 3 pockets measures approximately 8-1/4” tall, 4” wide, and 3-1/4” deep. 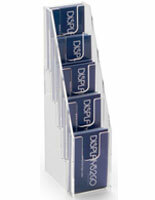 The depth of each pocket of the holder is 3/4” deep to hold numerous certificates. 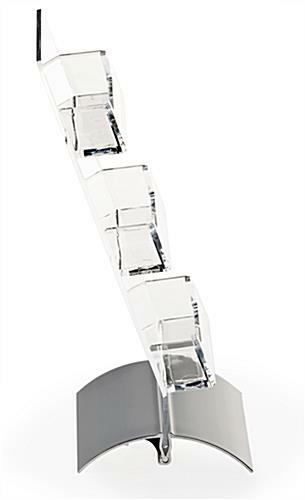 This retail certificate holder, gift card display has the ability to present many potential holiday presents at once! These types of certificates are a convenient and popular choice for presents for all occasions because they give the recipient a choice of how to put it to use. 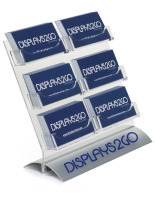 This gift card display, also called a countertop stand, is an inexpensive retail fixture for generating impulse purchases. 6.5" x 8.3" x 3.3"
The order came in fine and everything looked nice. I didn't have any problems purchasing or receiving the display. However, it took less than 2 days for a customers to knock it over with a handbag and break it. Kind of bummed I didn't even get 2 full days out of it. Next time I will buy a spare. We're so sorry to hear this, Michael. One of our customer care specialists will reach out promptly to assist. Thank you for your patience! So you gave this product a 2-star review because YOUR customer broke it? Doesn't make sense. Posted one year ago by Chris C.
This three tiered stand is perfect to hold two of our executive's business cards as well as one general informational card. It looks professional and travels easily. Love it!